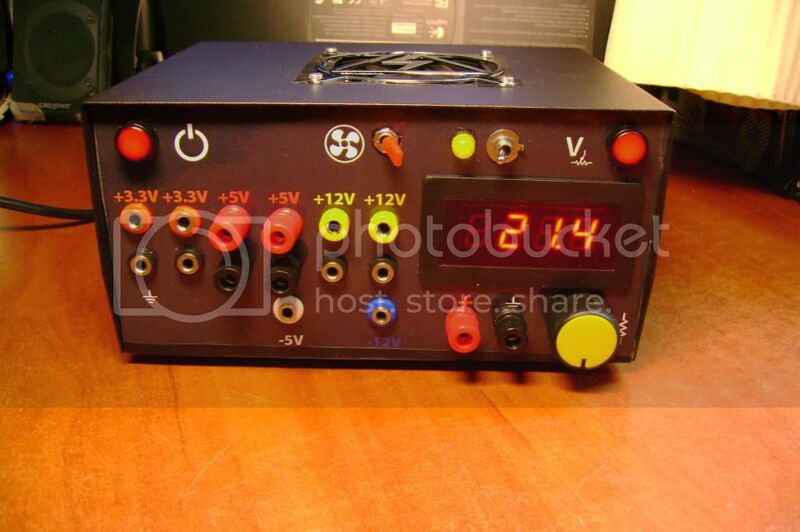 Miskatonic Institute of Technology: PC power supply modification. ATX PSU hack with regulated variable voltage and LCD voltmeter. PC power supply modification. ATX PSU hack with regulated variable voltage and LCD voltmeter. I needed a PSU (Power Supply Unit) for my electronics projects, so I modified an old ATX PSU (computers' power supply unit). It outputs a total of 400W and has a regulated variable voltage output of 1.25V to ~21.75V (DC). I used a LM317 voltage regulator, some switches and the original PCB of the PSU. The project turned out to be extremely easy to build, minimum soldering, finished it in 1 day! The LCD voltmeter operates on 5V, so i had to use a 2nd LM317 to get 5V from the 12V line. The small veroboard was the only thing that needed to be soldered, and it holds the 2 LM317s. The box used was this one. a standard PSU already has 5V lines, so why the need for the second LM317? Because if i power the LCD screen from the same 12V line that i power the variable voltage. WHEN the variable voltage output is switched ON, the LCD is switched ON too. If i had used one of the other 5V-lines, i would have had the LCD screen ALWAYS ON, even when i did not use the variable voltage output. But couldn't you install a simple switch on that 5V line, just before the LCD? It could be a double switch so it would switch both the variable voltage output and the 5V LCD on at the same time. Total cost of 39€ (with 18€ for the 2 red LED push-switches). If you have the PSU, you can do it for as low as 20 Euros..
Nope, the case is not custom. It was a generic case which I modified to fit my needs. The generic case was from this family: http://www.teko.it/it/prodotti/famiglia/AL/serie/15 . I is made of aluminum and cast iron. The aluminum was very easy to drill and cast iron gives great structural strength..
To be perfectly honest, i used this box: http://www.normabox.gr/website/product_info.php?cust_id=&template_id=&lang=gr&cPath=8&products_id=36. A greek copy of the Italian one.. Thanks but i live in the U.S. have any idea where to get a similar box in the U.S.
As for the BOX, just go to your local electronics project shop and find something in which your project can fit in. Mine was 200mm X 160mm X 100mm.. Measure your PSU's PCB first..
What do you need the step-down converter for? You want to use it instead of a LM317? If so, yes, it's more powerful and you may consider it. The switches: top left is POWER, top center is FAN ON/OFF and top right is VARIABLE VOLTAGE ON/OFF. There is an indicator light and a switch. 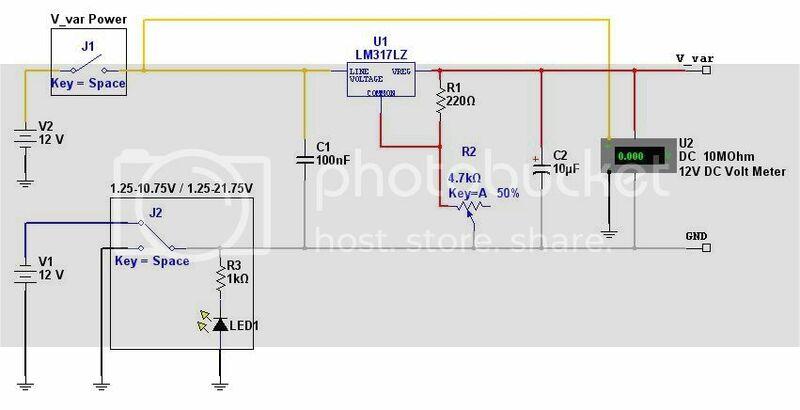 The switch switches the variable voltage from 1.25V to 10.75V to the stand-alone 1.25V - 21.75V. This is because the LM317 is connected to the GND and 12V line (giving maximum 10.75V) and the -12V and 12V line (giving an maximum of 21.75V BUT THE GND IS THE -12V NOW, which means you have to connect every ground of your circuit to the GND of the VARIABLE SUPPLY or -12V!! That is why it is stand-alone..). The yellow LED light turns on when the "stand-alone" function is activated to warn you. To have available the -5V pin connector means that you had an old atx psu, cause the latest ones doesn't have it. Keep up. I hardly understand ... the process, if you pleas send me the full schmatic for this .. Looking for a custom-made Flight Console? Do you want to have your own "ICARUS ONE" custom built to fit your needs? Ask me at numca.of.cs gmail.com! Για την ολοκλήρωση των project απαιτούνται υλικά, αλλά λόγω της τρέχουσας εκστρατείας για την κατάκτηση του πλανήτη, οι οικονομικοί πόροι του Πανεπιστημίου είναι περιορισμένοι. Όποιος διαθέτει κάτι από αυτά τα υλικά και δεν το χρειάζεται, παρακαλείται όπως το προσφέρει για επανάχρηση. 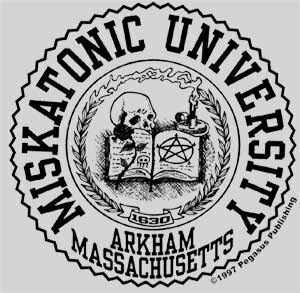 See you on Feb 12th..
Senior student in Miskatonic Institute of Technology, Department of Renewable Psychic Energy.